Nathaniel Goodrich, one of the men to cut the Garfield Ridge Trail described the route as “a horrible mess,” “an awful tangle” and “Also there were bugs.” Hiking the ridge trail today is easier than crawling through trackless spruce thickets, but it is still a route with a Puritan character. 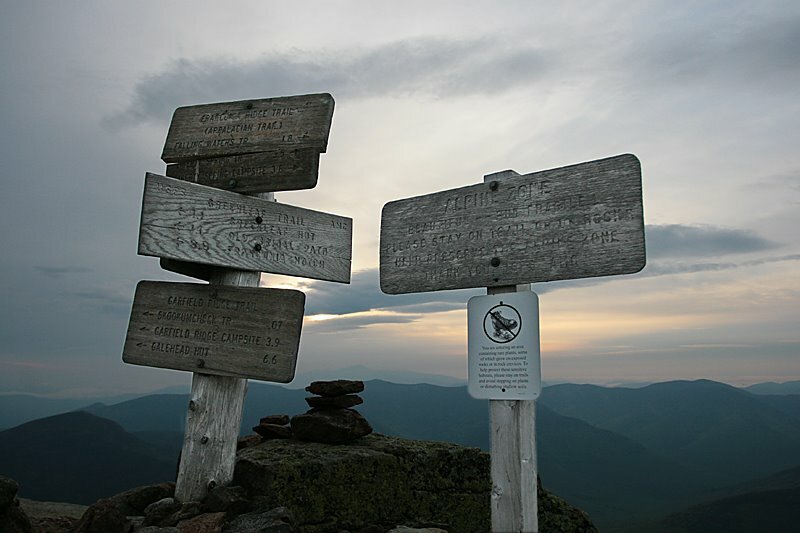 The hike is hours of toil for two revelatory views of wilderness. I left Greenleaf around 5:30am and climbed Lafayette. 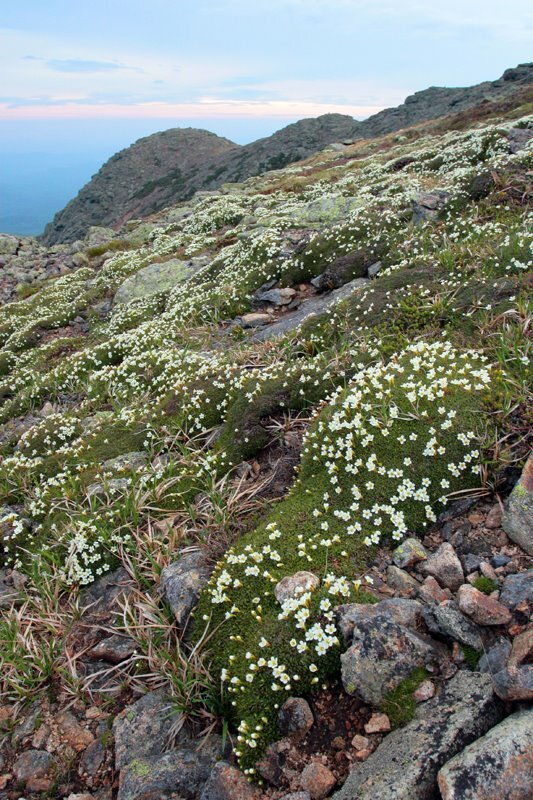 The diapensia are in full bloom on the mountain (photo). 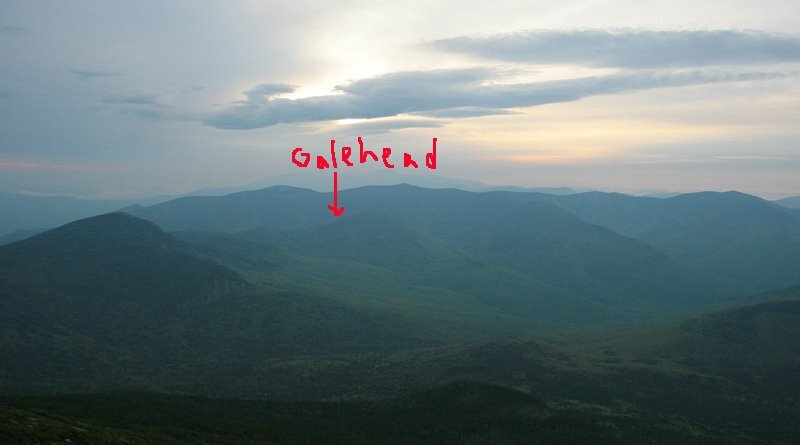 From the old foundations of the summit house Galehead looked distant (photo), and I regretted eating only a candy bar for breakfast. The wind was cold and carried a few drops of rain. I kept my pack on and kept walking, down over all the false summits of Lafayette and into the spruce. A few miles later I emerged from the green tunnel onto the top of Garfield. 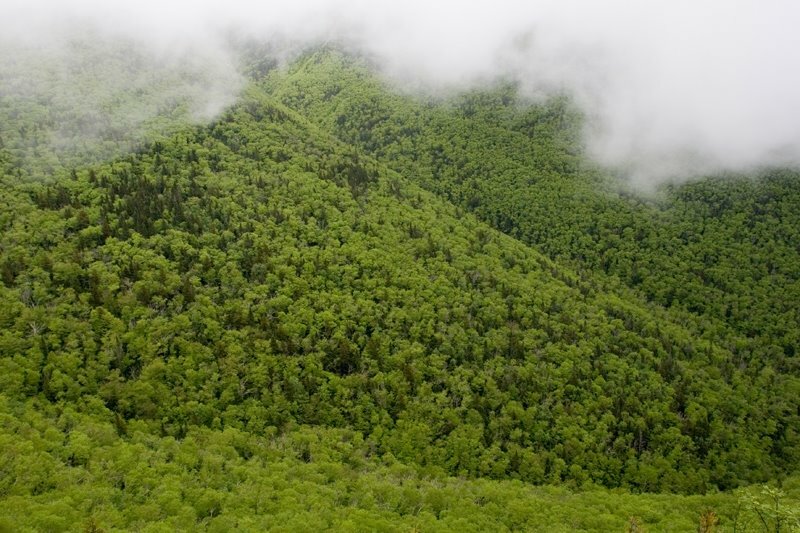 After three weeks of wet weather the Pemigewasset Wilderness is as emerald and unbroken as a rain forest. I continued on to Galehead and arrived as the crew was cleaning up the breakfast dishes. Selena, the naturalist, was away, and so the hut was in the hands of three boys (photo). Nate Lavey of Dunbarton, NH was looking sleepy after cooking breakfast. James Wrigley, of Lexington, MA was hutmastering, which included aerating the waste in the composting toilets with a pitchfork, and then filling out a food order for the coming week. Dan Cawley, of Conord, NH was getting ready to hike out with a load of trash and the week’s paperwork. While I was at the hut Nate mentioned that he had not called his mother since before Memorial Day. I suspect that any regular readership this web log sees is composed of mothers. Specifically crew mothers who are hoping the posts or the photos will give them some better idea of what their sons and daughters are really up to. As their boss I am equally interested in what they are really up to. Thus far this season I have only caught them doing what they should. Mrs. Lavey, in case Nate has not called, he is well. On my visit he had made some delicious pancakes. He favors wearing an old pair of brown shoes and pants with the legs rolled up. I’ve posted a photo of him beginning his bread dough for the day. After breakfast at Galehead I hiked down the Gale River Trail. The population of the forest understory has shifted already. 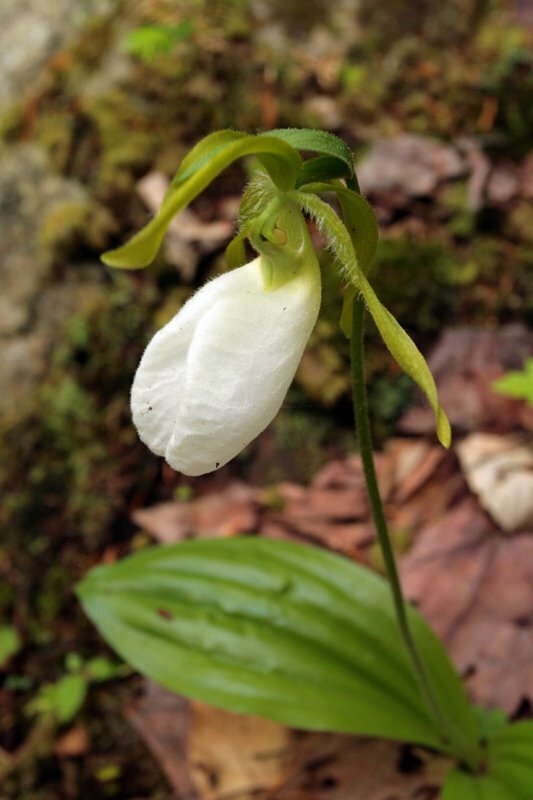 The trout lilies have disappeared, flowers, leaves a nd all. The trillium have also vanished. 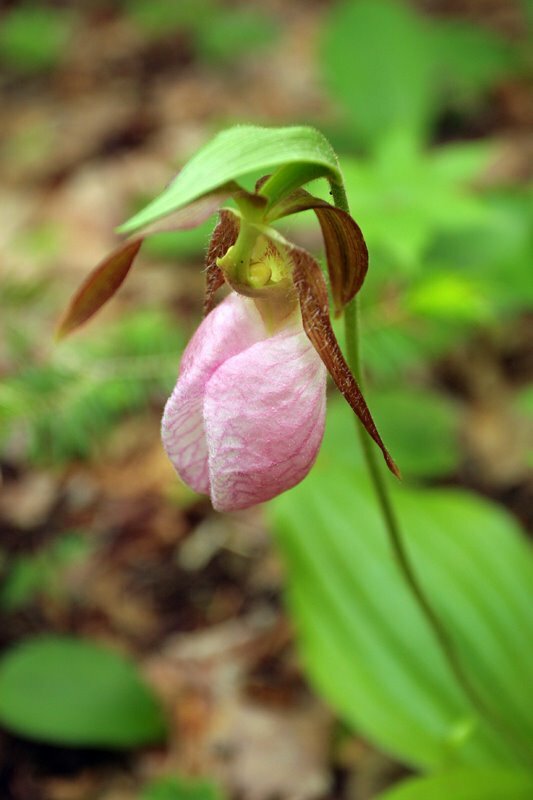 In their place are lady slippers, in both pink and white (photos). 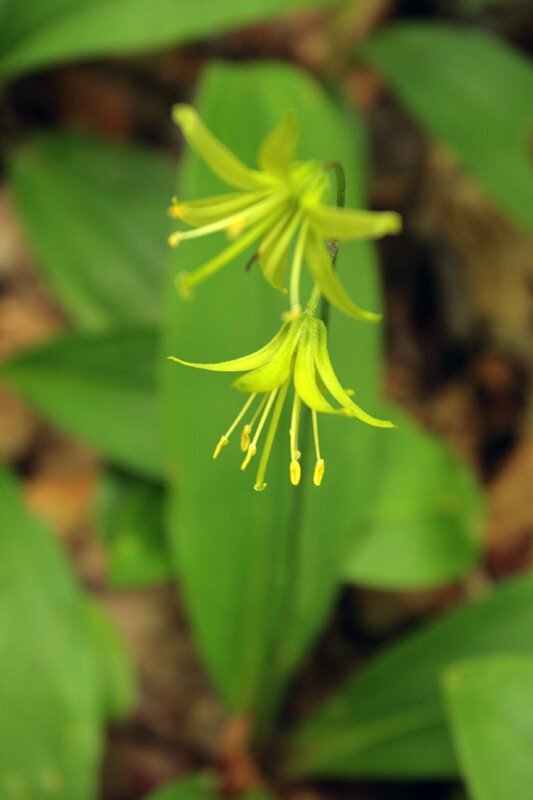 The blue-bead lily is also out (photo) with starburst-yellow flowers that will later become a blue berry. I got a ride back to Lafayette Place, where I parked the day before. 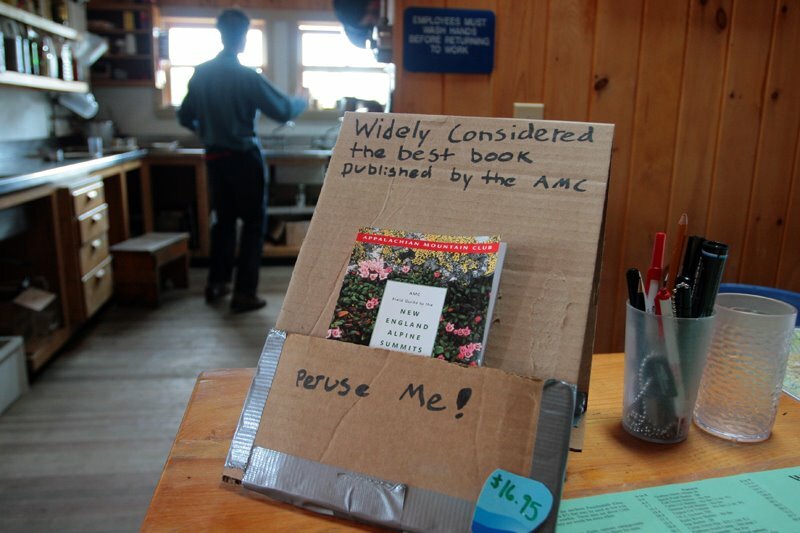 As I arrived the two-way radio began crackling with word of an injured hiker on the Lonesome Lake Trail. I started up the trail, again wishing I had eaten a heartier breakfast. Half a mile up I came upon members of the Lonesome crew bandaging a bleeding hiker. As I got closer I realized the hiker was one of the crew. In the middle of several packboards and backpacks was Hillary Marlena Gerardi. Despite a name fit for a South American novelist or poet she is from the Northeast Kingdom of Vermont. On her way down from Lonesome with a load of trash she rolled her left ankle and fell. Her right knee smashed down on a sharp rock. “I could see white” she said, “I think that was my patellar tendon.” Dave Kaplan, visiting from Madison, had bandaged up her knee, whil e Andy Patari ran back to the hut for a litter. Hillary was stoic, but I could see how scared she was that this might end her season at the hut. Later in the summer she has plans to climb Mt. 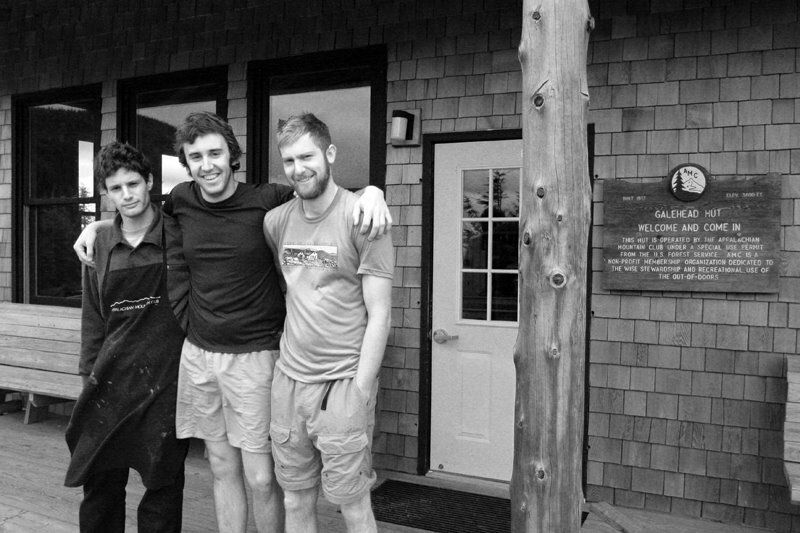 Rainier with a group of Middlebury College students. Sitting on the trail, holding her knee together, she was shivering a bit. Erin Robson, the assistant hutmaster, cut the arms off her sweater to add to the bandaging. The bleeding slowed, and Hillary is not too much heavier than a packboard with a few turkeys, a case of eggs and some frozen vegetables. With six people carrying the litter she was in the parking lot in less than 10 minutes. A few of her crewmates drove her to the Littleton Hospital ER. The doctor sewed up her knee, and sent her home with an ankle to hip knee immobilizer. After a few days at home she hobbled up to the hut on crutches. After the litter carry I went back to Pinkham and did paperwork.